The word yiayia means grandma in Greek. 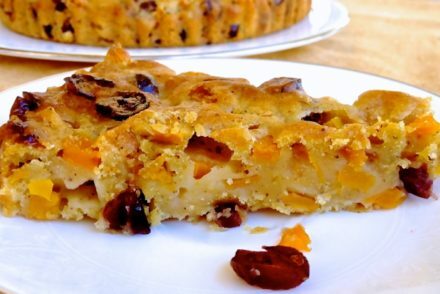 My mom now is known as “yiayia”, as she has grandchildren, and this is her recipe. 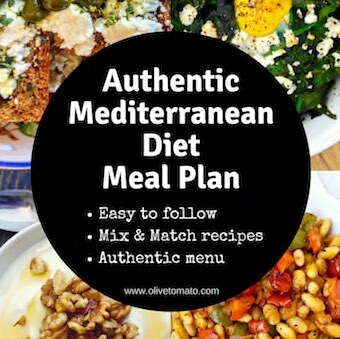 Now, this is not some really old recipe but it is a Mediterranean diet approved recipe and an example how my mom can turn any recipe into a Greek recipe. For a few years in the 80’s my family and I moved from Chicago to Athens. 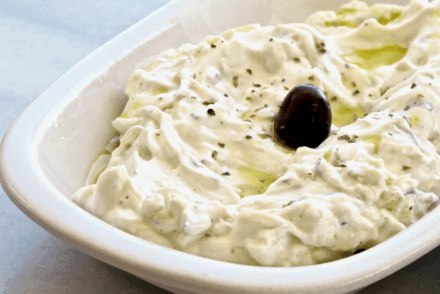 At that time Greeks were already going through a transition in their eating habits and loving everything foreign (xenomania as we call it). At that time it was very much in style to make certain types of casseroles that were called soufflés (but not really) that were really gratins. My mom came across a recipe on a margarine package called “Yiayias potatoes”. The recipe called for layers of potatoes cooked with margarine (of course) and in between layers of shredded -foreign- yellow cheeses such as emmental (Swiss), ham and even cream. Now, apart from that, many of these cheeses have little taste for Greek standards, and when they cool they get hard and rubbery. My mom thought, why not do this with feta cheese and olive oil? She also added her favorite herb; oregano, along with some lemon. The result is delicious and healthier as well. When she makes these we eat the whole casserole dish, because they are irresistible but not so heavy. Preheat oven at 400 degrees Fahrenheit (200 degrees Celsius). Brush some olive oil in a casserole dish or other dish about 8 x 10 inches. In a large bowl mix the potatoes with the olive oil and oregano. 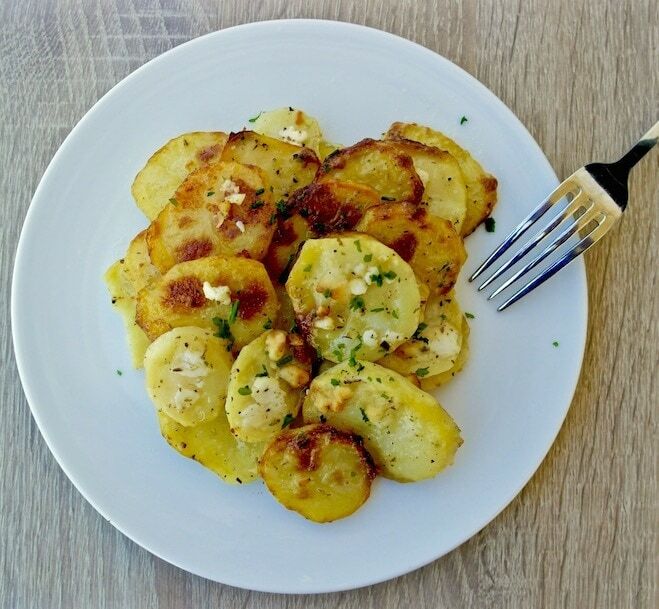 Place one layer of potatoes, sprinkle with a bit of salt and pepper and half of the feta. Place a second layer of potatoes repeating the sprinkling with feta, salt and pepper. Take about ½ cup of hot water and mix it with the lemon juice and pour it in the corner of the dish. Tilt so the water spreads in the whole bottom of the pan (the water should be enough to cover the bottom potato layer). Cover pan with aluminum foil with a few slits, and bake for about 10 minutes (with the fan). After 10 minutes have passed, lower the heat to 320 degrees Fahrenheit (160 Celsius) and bake for about 1 hour, checking to make sure that the potatoes are cooked all the way through (check with a fork-it should easily pierce the potatoes). Remove foil and bake uncovered for about 10-15 minutes to brown. Do not over-bake there should be a bit of water left on the bottom. This looks delicious! I’ve got some feta in the fridge that is destined for this dish. Can you explain the “soaking in water” part of the ingredients. Why and when? After slicing? Dry before mixing with oil? Thanks! Love your blog. 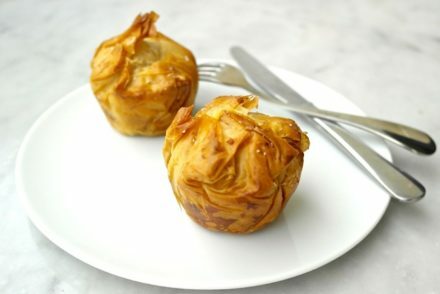 I adore your blogs; every single one of your recipes is fabulous. Many thanks. Happy Easter Kathy! Yes, just make sure you cover them with aluminum foil so that they don’t dry out.